Awkward adolescent boys everywhere suffering from fear of rejection can take solace from the fact they need not confront their fear, unless through their own exertion, until the search for a prom partner at the tail end of high school. In the meantime all there is to do is wait patiently for the acne to clear, the voice to break and the self to be found; they can envelope themselves in the comfort that somewhere below the surface there is bubbling a fully formed, handsome and self-assured adult. Meanwhile it’s simply out of their hands. It’s all just a matter of time. Fortunately for boys in Scotland the wait is not so long (that is, for the rejection, not the adulthood) for they have the opportunity to confront their crippling inadequacies from ages thirteen straight through to the (nominally) formative prom experience at least once every term when, as part of Physical Education, they learn to ceilidh. It’s never formally announced but you see it coming. For the past month or so you’ve done nearly every sport there is to do on the rotation: you’ve made it through football, basketball, badminton and gymnastics. Swimming cancelled due to lack of interest. The days are getting darker and the weather colder. Passing the drama hall one day you hear the dim, metronomic beat of an accordion and feet shuffling. Sweating now in anticipation, there’s nothing more you can do but scurry home, comb your hair and try and purge the burgeoning colony of zits from your chin. The teachers are sympathetic but their sympathy is misguided. They decide the best way to mitigate any embarrassment on part of the boys is to have them line up against the wall, and have the girls choose a partner. But really it’s worse, it’s like death by firing squad, you just desperately want to get picked off first so the pain is over and, oh God, so you don’t have to witness anybody else being taken away before you and, alas, you aren’t and knew you wouldn’t. Then comes the inevitable quandary as the imbalanced ratio of boys-to-girls means you’re left dancing with Big Tony P and his size twelve steel toe caps, which fact alone quashes any argument as to whom is to play the girl. And the soundtrack to this lesson in humiliation was, always and without question, Jimmy Shand. Nobody really knows when they first heard, or heard of, Jimmy Shand. Like the force of gravity or your mother’s maiden name, you cannot recall a time before your awareness of his existence. In a paradoxical sense he never really existed at all, so woven into the fabric his significance goes completely unnoticed. But his impact on Scottish life is indelible; his name a synecdoche for Scottish country-dance music at large, like Hoover or Biro. Did you know Jimmy Shand is the only person in the Hohner Musikinstrumente company portfolio with an instrument named after him, the Shand Morino, which Jimmy himself designed in the 1940s? Did you know his indisputable smash hit, The Bluebell Polka, was produced by George Martin, before he became producer for the Beatles? Did you know Jimmy composed more songs than the Beatles? And that he sold incalculable (due to unreliable sources) millions? Even if you didn’t know any of that, or knew Jimmy Shand by name, you’ll know it when you hear it. 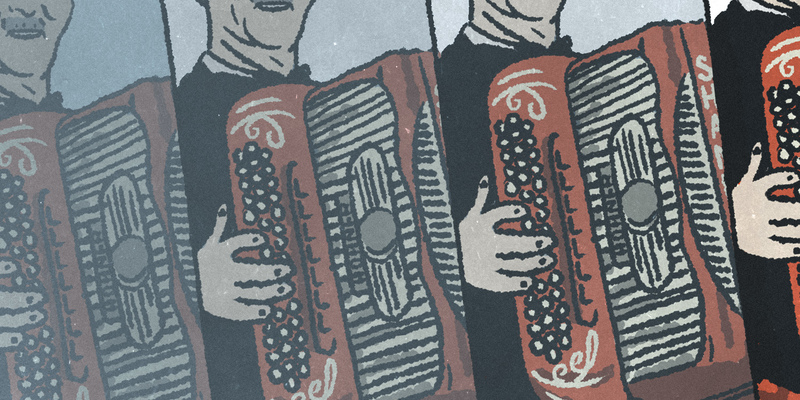 In the same line of tradition as blues, folk and jazz, Jimmy’s music is referential; it’s more than likely all his songs are based on previous compositions, but what makes him significant is that he made them his own, with a rigorous technical prowess that gave cause for fellow Scots accordionista Phil Cunningham to christen him the “human metronome”. And, as in the same line of tradition as house, electronic dance music and Euro disco, it is not intended for listening to in vacuo. You’re supposed to dance to it, and any ceilidh dance hall occasion worth it’s salt will have at least a handful of Shand compositions in its setlist. This alone is integral to how Shand remains simultaneously ubiquitous yet obscure; he is an essential component of, but not the thing itself. It also explains how he could be so successful without having to play the part of bombastic front man, typical of other international rockstars, of which he was quite the opposite; his onstage presence was frequently described as ‘funereal’. Despite Jimmy’s halcyon days being the 1950s (during the middle of which he released his (aforementioned) indisputable smash hit, The Bluebell Polka, which stood at number twenty for two consecutive weeks of Christmas ‘55) when he was middle aged, the lasting image of Jimmy remains as an old man. As with everybody who came of age before the seventies didn’t grow old the way we do nowadays – with overabundant visual stimuli recording our every step down that inevitable road, wrinkle by high definition wrinkle – Jimmy was no exception. Of the rare moving imagery that still exists (amateur sleuthing confirms his Top of the Pops performance in 1962, which may I add was the only time a Scottish country dance band ever played the programme, is lost to the annals of history) the most comprehensive is a video recorded with his son in 1990 in a dance hall in Letham – Dancing with the Shands – near his home of Auchtermuchty, Fife, when he was 88 years old. It’s an odd video, difficult to describe, a sort of long form music video-come-but-not-quite dance tutorial. A presenter primes the audience before each number, beseeching us time and time again to sing along to a compendium of songs that are by and large quite wordless, and as the music plays the camera pans the dancehall, taking in the grey curls and endowed stomachs of the dancers who move in time not unrhythmically but with meticulous carefulness, and occasionally a bucolic montage of glens, castles and lochs fade in and move across shot, seamlessly merging from one into the other like the images of dreams. Then the camera will return to Letham and we catch a glimpse of, sitting behind a music stand emblazoned with JSJ (The second J stands for Junior, as it’s Shand’s son’s band that is really taking centre stage here) and, wearing like the rest of the band a maroon tartan dinner jacket, Sir Jimmy Shand himself. Watching the video in its entirety (something I would never admit to have done) without joining in on the dancing or singing you begin to notice there’s something perennially dreary about this kind of music. Jimmy could turn even the most tub-thumping of anthems like Scotland the Brave into a dying breath; his renowned precision starts to feel mechanical and cold. And it weighs down on you in a weird, almost imperceptible way, like morning dew on a rain jacket. Rather than feeling calm and well rested, you feel tired. In a way, everything about Dancing with the Shands summarises what Jimmy and his music meant to me as a teenager, deliriously anxious and waiting for somebody, anybody to dance with me: awkward, old and doddery. Sentimental and nostalgic. Embarrassing old hat. Uncool. And Shand himself personifying what could be the worst bar none of all egocentric adolescent nightmares; of going unnoticed in a room full of people, despite your obvious talents. In adolescence we begin to form a hazy understanding that adulthood is basically about making choices, with high school particularly significant in this regard as the first time we get to consciously make them without any real or immediate consequence. More importantly, it’s the time when the freedom of choice is synonymous with the making of an individual. We did not choose to be Scottish. We did not choose to learn to ceilidh, or to listen to Jimmy Shand. These were vestiges of the things we had to endure, like Burns poetry recitals every January or church proselytising every Friday in primary school. Along with our parents they become the very things to rebel against, the established order. Even if we did enjoy these things there was no chance in hell we’d tell anyone about it – because doing so would seem to imply a lack of choice, a spoon-fed gormlessness that we’ll take whatever’s given to us, like the people who laugh at a bad comedian just because they’re told he’s (meant to be) funny. I never had heroes when I was young per se, but there were definitely bands and artists, mostly guitarists – Angus Young, Jonny Greenwood, Peter Green – who fascinated me, made me want to be them, who were by and large either dead, old or inaccessible. In my fantasies I played their songs to stages of thousands and claimed them as my own. I alternated between guitarist, drummer, bassist and singer – whichever had a particularly good part in a song. On the walk to school I figured out the answers to every conceivable question interviewers could ask, from musings on my creative influences to thoughts on the Difficult Second Album. Now and then during a zit-popping session in front of the mirror I would pause to practice my photo shoot aloofness. The irony of how much these fantasies relied on the presence of other people only to better stoke my own individualism was lost on me at that age. High school ceilidh lessons not only break down this misguided image we’re slowly making of ourselves as divine individuals, uninterested in the culture we’ve grown up around, destined for greater things through the products of none but our own free will and agency, but also remind us that we live among people we would perhaps rather not have to hold hands and dance with, much less talk or connect with on any real level. The paradox of all this isn’t the tendency of young adults to form groups so they may better express what makes them different, but the simple fact that ceilidh dancing is fun. It’s so effortless, even the most complicated dance takes less than five minutes to learn, there’s enough varieties of dance to ensure none grow tedious… And, yes, Jimmy Shand’s music suddenly makes complete sense. During an Eightsome Reel or Gay Gordons, you do not want to hear killer hooks or a tear jerking bridge, but something steady and consistent. Tiredness only comes from not joining in. Otherwise it is calmness in motion, meditation with a time signature. Yet because so many of us were stuck with the notion that there was something better going on elsewhere, in some place we’d much rather be, we denied our own enjoyment of it. Worse, we denied a chance to do something that would become increasingly rare as we became adults in the social media age: the chance to forget about ourselves. The problem with most group activities nowadays is that they involve being part of an audience, meaning there is always a boundary or something hierarchal in tow. You’re very much aware of your place as watcher versus performer. Not so in ceilidh dancing. Even Jimmy up on stage, or perhaps a more garrulous musician directing people on the steps, is not there to be watched. And when you’re no longer worried about where to place yourself in this grand scheme, whether you’ve chosen the people you’re around or not no longer matters. That, in essence, is what ceilidh music, and dancing, means: realising that just because we didn’t choose something doesn’t mean we can’t belong or contribute to it. Or that it’s absolutely fine, if not crucial, to show empathy and familiarity toward people you would never consider friends, or may only know for the duration of a reel. It may sound a dull platitude, but even after touring the world at a time when touring the world was not a choice open to most people, Jimmy didn’t forget where he came from. Despite any faults it had, despite not choosing to be from there. That alone makes him a symbol for something far greater than anything a teenage boy might dream.